28 Year old Australian Paralympian Jessica Smith has a great story to tell. Not only has she had remarkable achievements in her sporting career, but through some pretty dark times as a young woman, she has emerged to use all those experiences as fuel to create an import body revolution. Jessica was born with her left forearm missing, and as a toddler suffered third degree burns to 14% of her body in a horrific incident. Not exactly the easiest start to life. She grew up constantly battling body image issues, surrounded by a world which placed too much emphasis on the way you look. She is not alone in that respect, many of us Gen Y and Gen X girls have been bombarded with the notion of physical beauty being the key to any form of success from a young age thanks to the media, fashion and advertising we consume. 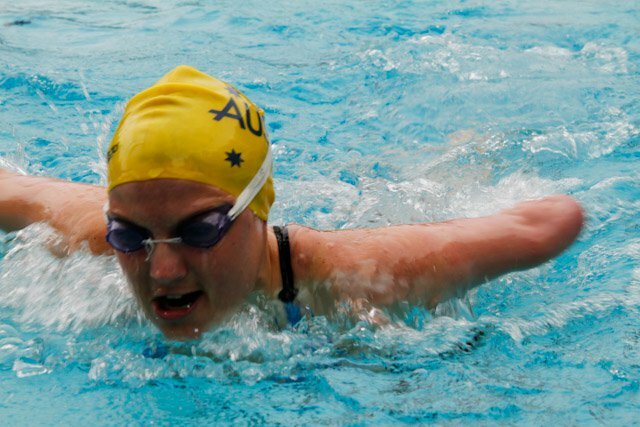 Jessica eventually found her release in the swimming pool and turned her talent into a decade long career which saw her competing at the Paralympics. She officially retired from professional swimming in 2007, but her athletic career gave her the big platform she needed to spread a very important message to other young women about self esteem and body image. During the 2004 Athens Olympics her performance in the pool was dismal, mostly because she had suffered from eating disorders which didn’t allow her body to be up to its physical peak like the other athletes. It was a wake up call for her, who has admitted to not eating for days, convincing friends and family it was part of her strict diet for training. She would often punish herself by running for miles and miles, thinking it was the only way she would reach perfection. After a 6 week hospital stint following the Athens Paralympics, she knew she had to make a change, or seriously damage her body and put her life in jeopardy. Smith is now based in Perth and today spends her time as a motivational public speaker and started Join The Revolution, which is a campaign dedicated to raising awareness of positive body image through social media. Part of her work is speaking to high school students about her experience and helping them tackle certain issues when it comes to Eating Disorders. This is an important work that more and more people need to do. When we interviewed 18 year-old Cami Julaine last year who took a year off high school to be in treatment for various eating disorders, she spoke about how there is a lot of misinformation out there and educating people about ED’s is much needed, for both the victims and their loved ones. Jessica echoes the same sentiments, especially when it comes to the long term effects both physically as well as mentally. All the self-inflicted abuse she did to her body has resulted in expensive dentist bills, digestive problems and constantly low electrolytes. “I’ll be in recovery for the rest of my life and the issue with eating disorders is that it is not taken seriously,” she says. Her experience in the professional sporting world has opened her eyes to the immense pressure on both men and women to look a certain way, which in itself can easily lead to an eating disorder like anorexia or bulimia. “Eating disorders are rife in the sporting world, due to pressures to have the perfect physique. It’s not just girls but also guys who have to deal with the issue,” she said. So far her work has been recognized by the Australian public who voted her as an ‘Emerging Leader’ in the 2013 Positive Body Image Awards. For all the heartache and pain she suffered, it wasn’t all in vain, and Smith is probably one of the best types of advocates a young woman can look up to if they have an eating disorder. She hopes her experiences will be enough to show these young men and women not to make the same mistakes as she did and live a healthy life. No matter what horrible experiences we go through in life, we eventually have the ability to step back and make a choice, whether responsible or irresponsible. The responsible side of it is to use what we learned and to pay it forward to help others in need. Then none of it will be in vain. The irresponsible way would be to wallow in self pity and forever be comparing ourselves to others in a cheap attempt at perfection.